Have you ever heard the phrase, “Pull of the moon?” There is something so magical and mysterious about the moon. As our bodies are made mostly of water, the pull of the moon not only effects bodies of water, but our own internal waters as well. 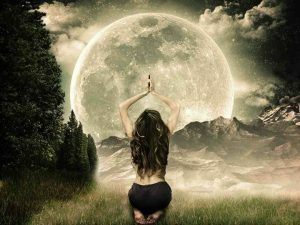 We may find ourselves feeling withdrawn and fatigued during the introspective new moon, or we may find ourselves full of energy and/or agitation, insomnia during a full moon. Each cycle like a wave building and receding. In addition, historically, women on their cycles called this time a moon cycle. Without the artificial lights, devices and constant stimulation, women’s bodies naturally attune to the cycles of the moon. In hatha yoga, the nadis (channels of energy) are also associated with the energy of the moon. Left nostril breathing, for example, is said to be lunar in effect, and is great to practice before bed to enhance our sense of calm and well-bring. During our women’s group moon circle, we will explore our connection to the full hunter’s moon arriving this October. We will begin our circle with a yoga practice consisting of the moon salutations, an introspective flow that takes us on a journey to the self. We will conclude the active portion of the evening with a guided moon meditation. During the second half of our circle time, we will work with crystals and oracle cards. The full moon is associated with bringing something to fruition, or the final stage of manifestation. We will learn to program our crystals with our intentions and how to cleanse crystals in the light of the moon. During the hunter’s moon, we go deeper into the yin energy of fall as the year begins to draw toward a close. We will journal about own own personal harvest of the year – what are our biggest takeaways from the year behind us? What do we wish to let go of, and what would we like to keep as nourishment for the next cycle ahead? Our practice concludes with restful and grounding restorative yoga, allowing the practice to seep into our awareness. We close the circle with discussion followed by dinner nearby – all are welcome to join us if desired so we can continue our connection and time together. Melanie and I hope to see you there for this special evening of connecting with other women, our own selves, and the mystery of the moon. Please bring a journal, pen, eye covering, and your own crystals or alter items if desired.